This color image from NASA's Curiosity rover shows part of the north wall of Gale Crater, the location on Mars where the rover landed on Aug. 5, 2012 PDT. The photo was snapped by Curiosity's Mastcam on Aug. 8. NASA's Mars rover Curiosity has beamed home high-resolution color photos of its Red Planet landing site, showing terrain strikingly similar to the deserts of the American Southwest. Curiosity snapped the pictures with its 34-millimeter Mast Camera on Aug. 8 PDT (Aug. 9 EDT), just three days after its daring and dramatic touchdown inside Mars' Gale Crater. Mission scientists pieced the 79 photos into a mosaic, with black boxes indicating hi-res images not yet returned by the rover. Curiosity had already sent lower-resolution versions of these photos to Earth earlier last week. The full-frame images, relayed while the six-wheeled robot was undergoing a software-update "brain transplant," measure 1,200 by 1,200 pixels, researchers said. The mosaic's constituent photos capture some interesting portions of the 96-mile-wide (154 kilometers) Gale Crater. For example, one shows a section of the crater wall north of Curiosity's landing site, where a system of valleys enters Gale from the outside. Scientists think these valleys were carved by flowing water, making this perhaps the first view of an ancient river system ever taken from the Martian surface, NASA officials said. This color image from NASA's Mars rover Curiosity looks south toward Mars' huge Mount Sharp. This is part of a larger, high-resolution color mosaic made from images obtained by Curiosity's Mast Camera on Aug. 8, 2012. Another portion of the mosaic looks south toward Mount Sharp, the mysterious mountain that rises from Gale's center. At 3.4 miles (5.5 km) high, Mount Sharp is taller than any peak in the continental United States. 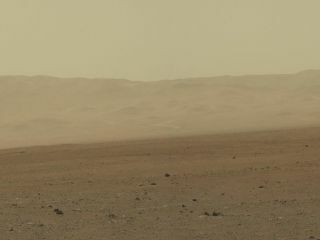 In this image, the gravelly terrain near the landing site eventually gives way to a dark dune field, beyond which rise the flanks and foothills of Mount Sharp. Finally, another section of the mosaic shows gouges blasted out by the rockets on Curiosity's sky crane, which lowered the 1-ton rover to the surface on cables and then flew off to crash-land intentionally about 2,000 feet (600 meters) away. This color image from NASA's Curiosity rover, taken on Aug. 8, 2012, shows an area excavated by the blast of its sky crane rocket engines. Bedrock is clearly visible in this image, which is exciting to Curiosity scientists. The rover's main goal is to determine if the Gale Crater area could ever have supported microbial life, and Curiosity will get at this question by studying the rocks and soil of Gale and Mount Sharp for the next two years or more. Science operations have been shelved temporarily while the mission team conducts the four-day "brain transplant" on Curiosity. The software upgrade, which should be done by Tuesday (Aug. 14), will help the $2.5 billion rover transition from landing to surface mode. The mission team has had a little excitement during the software upgrade. On Monday (Aug. 13), President Barack Obama called Curiosity's handlers at NASA's Jet Propulsion Laboratory in Pasadena, Calif., to congratulate them on a successful landing and to wish them well going forward. Curiosity remains in excellent health, researchers have said. They've found no major issues with any the robot's 17 cameras or 10 science instruments thus far.